The least costly way to save energy is through conservation. 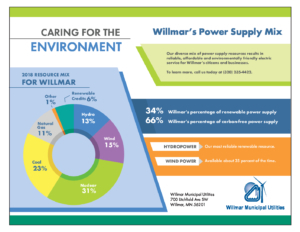 Willmar Municipal Utilities offers a variety of Residential and Business low cost/no cost energy saving tips to help everyone conserve energy. Click on the headings below to show/hide information. -Attic bypasses are pathways where indoor air moves into the attic. Seal air leaks and drafts around windows, doors, wiring holes, recessed lights, plumbing vents, attic hatch, etc. Keep regular maintenance on HVAC equipment including cleaning and replacing air filters, cleaning condenser coils, and evaluating service needs in advance. WMU residential customers can recycle their fluorescent lamps and light bulbs for free! Bring them to the Kandiyohi County Household Hazardous Waste office at 1400 22nd St SW in Willmar with a copy of your WMU billing statement (or pull it up on your SmartHub app) for free recycling. Willmar has two electric charging stations for your electric vehicle! One is at Mills Nissan dealership on S Hwy 71 and the other is at Goodwill on the east side of the building (by the main entrance). Check out http://www.mncharging.org/ to see where else you can charge on the go in Minnesota!